The 330 GT was introduced as a replacement for the 250 GTE which had been Ferrari’s first series production model to offer a four-seat cockpit arrangement. Two versions were constructed between 1964 & 1967; the appropriately titled Series I and II. Produced alongside the sultry 275 GTB and exclusive 500 Superfast; the 330 GT was designed as a more comfortable and less demanding vehicle to drive. The Tipo 571 chassis frame was in many ways a close development of the frame used for the outgoing 250 GTE. A number of important revisions were made including a 50mm wheelbase extension and the inclusion of adjustable Koni shock absorbers. The final series of the 330GT is known as the “Series 2” which features a five-speed gearbox instead of the overdrive four-speed of the earlier models. Other changes included the switch back to a twin headlight instead of a four headlight configuration, factory build options included: air conditioning, power steering and power windows which are all fitted to our car. The other improvements introduced to the Series 2 cars were redesigned turn signals, the fuel filler was moved from the right side to the left side and the slotted side air vents were changed to a three piece scoop design, with the most important changes being the 2 mount positioning for the engine and “hanging pedals”. A total of only 424 left hand drive models being produced makes these cars highly prized and rare. Our car #9105 is presented in Argento Auteuil with Black Hide interior was produced in 1966 and supplied new Chinetti Motors Inc of New York. The Ferrari remained in the USA until it was repatriated back to Europe in 2008 where it has remained ever since. Further works in 2012 including the re – chroming of the bumpers. The car is comes complete with the wallet, handbook & parts catalogue. The conclusion of our sales preparation and post sales services includes: the issuance of Ferrari Classiche Certification, service works and safety checks completed by an Official Ferrari Factory Service Agent prior to sale. 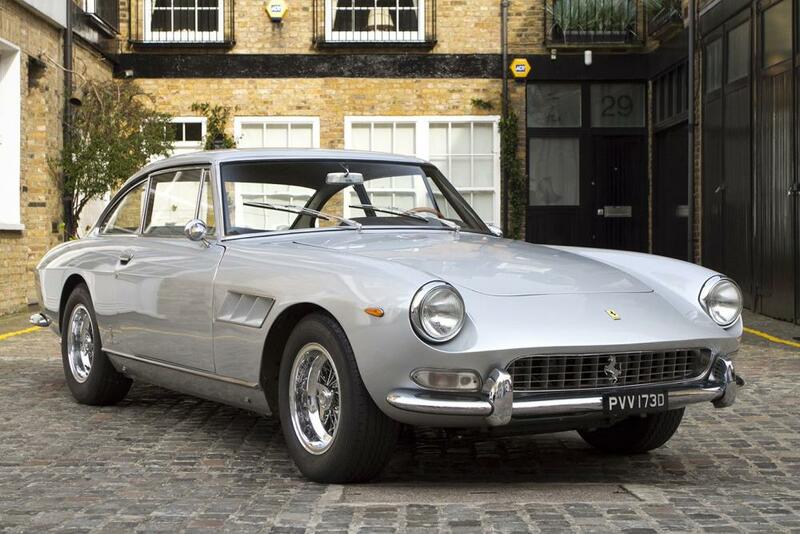 This is a rare opportunity to acquire one of only 424 cars produced with the correct matching numbers and the issuance of Ferrari Classiche Certification and original fit air conditioning, power assisted steering and power windows. This 330GT 2+2 series 2 is presented in superb order throughout and represents exceptional value in today’s marketplace.